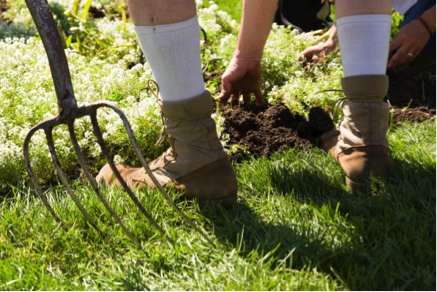 It was on a seasonably pleasant day this past May that 15 veterans from the Thresholds Veterans Project began a journey to be well in the Buehler Enabling Garden. 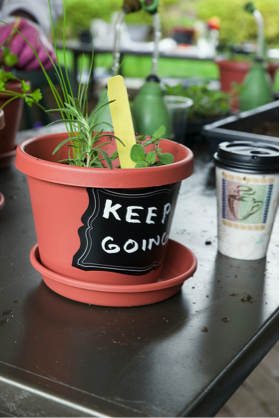 Inspirations: “Keep Going” planter, with a side of coffee. We toured the garden, got to know each other, and sipped on coffee. Lots of coffee. The activity I led was called Inspirational Herb Dish Gardens and was intended to provide these vets with a lovely planter of kitchen herbs to cook with, as well as a message of encouragement they could reference for inspiration in their daily life. After the first retreat was done, I thought to myself, “Wow! That was a really good program!” And it was. It was really good. Over the course of the summer, these vets returned to the Garden five more times to participate in various retreats all focused on wellness and using nature to heal. To date, more than 2.7 million people have served our country during the most recent conflicts. Approximately 1 million of these veterans have accessed the VA healthcare system for war-related injuries. Many of the injuries sustained on these missions are unique in that they are “invisible” wounds of war—traumatic brain injury (TBI) or post-traumatic stress disorder (PTSD) are difficult to diagnose, yet have large impacts on a veteran’s life. Symptoms range from mild to severe and include anxiety, hypervigilance, insomnia, irritability, and physical pain. Other common injuries sustained from these missions include musculoskeletal and missing limbs. For some, reintegration into civilian life, family, society, and employment may be difficult. In fact, even vets who were not technically injured in war often experience anxiety, hypervigilance, insomnia, and other stresses that inhibit their readjustment. Growing more than plants in the garden; friendships and individuals flourished this summer. Veterans who have not had success with traditional medicine often begin to seek out alternative ways to heal. That is where the Garden comes into play. We believe beautiful gardens and natural environments are fundamentally important to the mental and physical well-being of all people. We also believe people live better, healthier lives when they can create, care for, and enjoy gardens. I witnessed the amazing effects interacting with nature has on people this summer as veterans—some on the verge of homelessness—planted the Buehler Enabling Garden with summer annuals, overjoyed to return and observe the garden flourishing throughout the season. I witnessed veterans—some participating in in-patient psychology programs—get a pass from the hospital to come to the Garden and learn to rake a dry garden in the Elizabeth Hubert Malott Japanese Garden. I witnessed veterans—some clinically depressed—smile and laugh, as they dug potatoes from the ground in the Regenstein Fruit & Vegetable Garden. Veterans dig deep for potatoes and for well-being. Each of our six retreats was filled with creativity, education, companionship, and joy. As the summer progressed, so did the veterans, each of them growing stronger and more healthy in their special way, each of them changing and striving to be well. Our group started to call the Enabling Garden “our garden,” and the plantings we planted became “our plants.” Participants would tell me that this day (the day they came to the Garden) was the day they looked forward to the most. They would tell me how amazing the Garden is, and how safe they felt here. It was music to my ears, and I felt so proud of them. It was easy to draw comparisons about healing, being well, and growing to gardens this summer. Gardens start small and respond to weather and temperature. They grow and change with the season. Sometimes they start to fail or get crowded out, or overgrown; sometimes they need to be watered or groomed to flush out new growth and blooms. With care and attention, however, they grow, and flourish, and bloom. They are like us. We are small sometimes. We are big sometimes. We respond to things that happen to us or things we do. But with love and care and attention, we can grow, we can bloom, we can be well. Gardens start over and each year is a new year. We can start over, too, and each day is a new day. 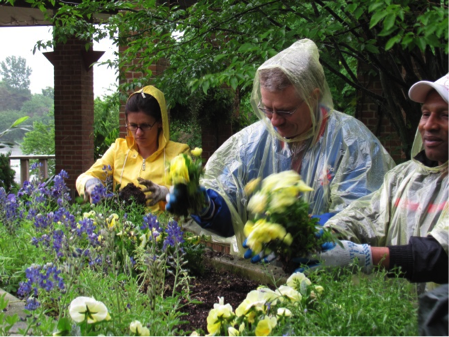 Vets plant rain or shine in Operation Summer Change-Out. I saw this summer how powerful gardens can be in helping people to heal and maintain wellness. Our program was effective because it created a sense of belonging and comradery, and fostered a feeling of continuing to serve, which is an important value to many vets. As Veterans Day approaches, remember the people who have served, put their lives on the line, and are still fighting today. Thank them, salute them, and honor them. I was honored to work with this amazing group of veterans, who became an inspiration in my own life. And I am so grateful to have the opportunity to deliver such a wonderful program. You can help valuable Chicago Botanic Garden programs make a difference in people’s lives. Click here to donate to the Annual Fund. Outstanding program. Excellent use of Chicago Botanic Garden funds. As I Vietnam veteran, I wish a similar horticulture program would have been available to vets returning from South Vietnam. What an amazing, and unexpected benefit of the garden. I just loved learning about this! And your metaphor of the garden starting over each year…and human beings starting over each new day…just beautiful. This is a wonderful, enriching program opportunity you have created! What a terrific support for our veterans, and your post was beautifully written. It’s fantastic to hear the Gardens are being utilized in this way. Really well done!